Over the years I've found myself caught up in a number of discussions about American cinematic ghost stories that start and end with the Robert Wise's 1963 The Haunting. It's not all that surprising. This was, after all, one of the first films – if not the first – to make the haunting itself the film's raison d'être. Previous film ghosts were employed for comic effect, to bring frightened couples together, or were manufactured by criminals to frighten away the susceptible, works like Elliot Nugent's The Cat and the Canary, René Clair's 1935 The Ghost Goes West, Jules Dassin's 1944 The Canterville Ghost and Joseph L. Mankiewic's 1947 The Ghost and Mrs. Muir. It wasn't until the the likes of The Haunting and Jack Clayton's 1962 The Innocents that the filmed ghost story really come of age. But they did have one notable forerunner, a film that preceded The Haunting by almost twenty years but too often gets forgotten in our collective enthusiasm for this acknowledged classic. Directed by first-timer and former theatre director Lewis Allen and adapted by Dodie Smith and Frank Partos from Dorothy Macardle's splendidly titled novel Uneasy Freehold, The Uninvited has the distinction of being the first Hollywood film to present a haunting as an authentic supernatural event. It does occasionally play it light – the soundtrack underscores a gag involving sea-sickness with a mocking wah-wah-wah-waaaah, and the final line of dialogue will likely make even a more forgiving modern audience wince – but from an early stage it is made clear that the haunting here is the real deal. And it really is rather scary. Whilst holidaying in Cornwall, music critic and composer Rick Fitzgerald (Ray Milland) and his sister Pamela (Ruth Hussey) fall in love with an abandoned coastal property named Winward House. 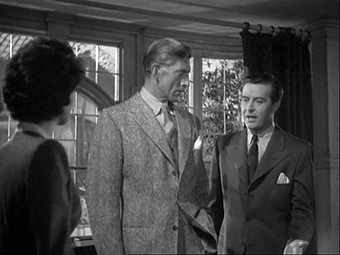 To their considerable surprise, they are able to buy it at a knock-down price from its owner, Commander Beech (Donald Crisp), despite the protestations of his 20-year-old granddaughter Stella (Gail Russell), who is still attached to the house in whose grounds her mother Mary died. In no time at all the Fitzgeralds have moved into their new home, but when they enter the previously locked upstairs studio they experience a disconcerting chill, and something unseen is clearly frightening the animals. That night, Rick is woken by the sound of a woman sobbing, and Pamela becomes convinced that the house is haunted by the spirit of the departed Mary. 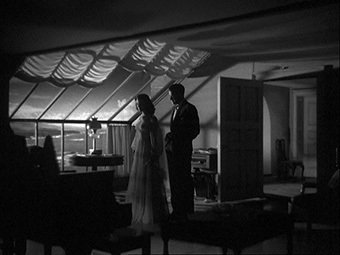 As was common for genre films of the period, the haunting of The Uninvited is just one component of a more complex, character-driven story, functioning as the catalyst for the Hero's Journey, a multi-stranded mystery for the lead characters to solve, and the driving force for a burgeoning romance between Rick and Stella, an age-gap relationship that was common in pre-70s cinema, as long as the man was the older party. What is surprising, perhaps, is the speed with which a supernatural presence is established, beautifully inferred by the fresh flowers that Pamela lays down in the studio and that wilt before our eyes. 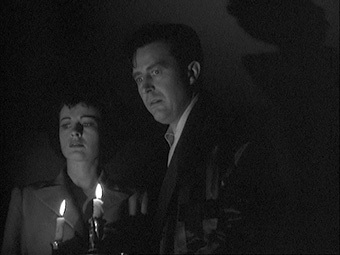 In common with The Haunting, sound and suggestion prove director Allen's primary weapons, with the sobbing that Rick and Pamela hear coming from "everywhere and nowhere" having the unsettling ring of genuine despair, while the off-screen screams of housemaid Lizzie and the subsequent torchlight search of the landing prove more unnerving than actually showing us the ghost. As the story unfolds, the mystery of Mary's death becomes the driving force of the narrative, as questions are raised about the circumstances that led to it and the relevance of her husband's widely known infidelity. When a trance-like Stella almost repeats her mother's cliff-top fall, her grandfather enlists the help of the Mrs Danvers-like Miss Holloway, a once close friend of Mary's who now runs a sanatorium, to which she has Stella secretly committed. As a mystery drama, The Uninvited is consistently engaging stuff, but it's the supernatural elements that have earned it its place in film history and remain to this day its principal attraction. Allen's ace in the hole here is Charles Lang's gorgeously atmospheric (and Oscar nominated) monochrome cinematography, whose use of enveloping shadow and vision-restricting light sources (the torchlight actually comes from the torches – rare for the period – while the spots used for the candlelight are subtle enough to convince you that the candles really are the source of the illumination) create an unsettling sense of a house that has secrets lurking in every dark corner. Allen also prefigures The Haunting in his original intention not to actually show his ghost, but studio apprehension about the lack of a visual payoff apparently forced a turn-around when the film was in post-production. Fortunately for all, what the effects team came up with is genuinely creepy, a floating and indistinct apparition that has an almost ethereal feel, one that may or may not have the capability to inflict harm on its uninvited guests. Great haunted house movies have been few and far between, and despite a handful of notable colour works – The Legend of Hell House, The Changeling and The Others among them – it's clear that these earlier films, with their atmospheric monochrome cinematography and censorship-enforced restraint, had a real advantage when it came to creating a dreamlike sense of childhood dread. And while The Haunting and The Innocents have remained the genre's most widely celebrated ambassadors, The Uninvited was not only first past the post, but fully deserves to stand alongside these giants, and still has the power to prompt some serious shivers and a few raised neck hairs. The pre-publicity for this DVD release promised a remastered transfer, which we can presume is what we have here (there may be more on this in the accompanying booklet, but this was not provided with the review disc). Of course, our expectations for the results of restoration work on older movies have been raised considerably by the likes of Masters of Cinema, but restored and remastered are not the same thing, and since this is the film's first appearance on DVD anywhere in the world, comparisons with previous editions (we're talking VHS and laserdisc) are impossible for me to make. The transfer here is certainly not without its issues – there are dust spots aplenty and some visible exposure flickering that is particularly evident in darker scenes – but in other respects the image fares well. In the daylight scenes especially, the contrast is nicely balanced and displays a very pleasing tonal range. The detail is often very good for a DVD transfer, something that is once again most evident in the daylight exteriors – the night scenes tend to have a slightly softer feel. The Dolby 2.0 mono soundtrack fares rather well for a film of its vintage, the slight background crackle, inevitably narrow dynamic range and slight treble bias never affecting the clarity of the dialogue and music. "This is the sound of the uninvited!" the voice over informs us, and then proceeds to outline in unsubtle detail all of the signs of supernatural presence that the film will more effectively reveal, including the apparition. I really wouldn't watch this before the film itself. A rolling gallery, set to music, of promotional and front-of-house stills, posters and booklet covers. Supported by the Lady Esther Screen Guild Players, Ray Milland and Ruth Hussey reprise their roles for a brisk, neatly compressed reworking of the story for radio – the film's use of sound works translates particularly well here. There's an up-front warning about the sound quality due to the condition of the archival materials, which manifests itself as a background whine that will likely set your teeth on edge (and it gets louder in later scenes), but the voices and music are clear enough, and the historical value of the recording makes any flaws worth tolerating. The same film still stays on screen for the entire running time, which could cause problems for plasma screen owners. In rather better shape than the 1944 adaptation, this version for The Screen Director's Playhouse differs enough in structure and even character detail from its predecessor to make them fascinating companion pieces. Only Milland reprieves his original role here – the other cast members are listed at the very end. The play is immediately followed by a short and clearly rehearsed exchange between Ray Milland and director Lewis Allen. The release version comes with a booklet, but this wasn't included with the review disc, so I can't comment on its content or quality. It's perhaps due to its previous unavailability on DVD and a paucity of TV screenings that The Uninvited has slipped off the radar in recent years, despite a few prominent champions – in 2009 Martin Scorsese included it in his list of the 11 scariest horror movies of all time,* alongside the likes of The Haunting, The Changeling, Night of the Demon and Psycho – though this very lack of exposure has also protected it from that most ignominious of fates, the crass, overblown, CGI-driven remake (a little ironically, the 2009 The Uninvited was actually remake of Kim Je-woon's 2003 A Tale of Two Sisters, a title change doubtless employed to disguise the fact that it was a remake). Exposure's DVD release is thus doubly welcome, and while the print condition is not quite up to recent restoration standards, it's still very watchable, and the inclusion of the two radio adaptations gives this self-named Special Edition a pleasingly completist feel. Recommended.